Try something different with your sewing machine! 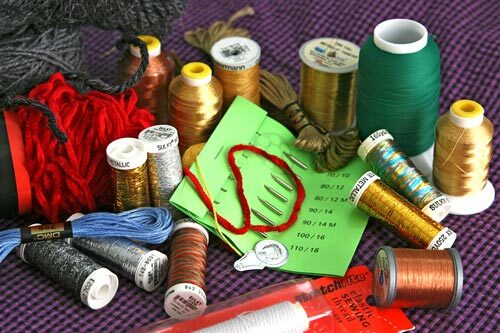 Specialty threads (metallics, woolies, stretch, embroidery, top stitching, perl, monofilament, invisible, yarn, upholstery, and many others) offer a world of creativity and expression for textile artists. Learn the technical skill in how to use them and which ones work better than others. We'll also review specialty needles and their various applications. This is a hands-on workshop so bring your machine (in good working condition). Pre requisite: you MUST have a good understanding of machine tension and be comfortable adjusting both top and bottom tensions on your machine. If you need more instruction in adjusting your machine consider taking Mastering Machine Tension as a primer before this class. A materials list will be sent when you register. There is also a $12 materials fee payable to the instructor.